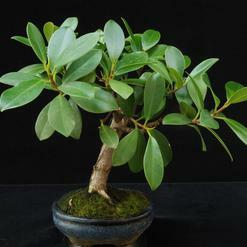 Indoor bonsai are bonsai which are cultivated for the indoor environment. 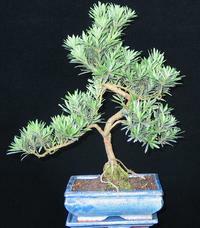 Bonsai are dwarf trees artificially shaped through special technique of pruning their branches and roots. They grow very slow in shallow pots and retain their size. Clay pots are shallow and shaped square, rectangular, round or oval, 2-3 times burned and resistant to low temperatures. The plants have to be watered regularly as the roots may never dry. There are indoor and outdoor bonsai. The place of growing has to be decided before the purchase. 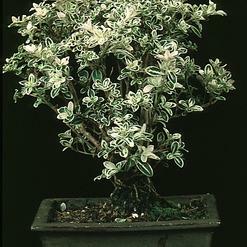 Indoor bonsai are easier to cultivate and do not demand any special care. 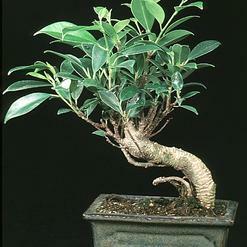 Indoor bonsai are mostly trees and shrubs originating from warm regions. They demand temperature above 20°C throughout the year. They grow continuously and do not demand a winter rest. Outdoor bonsai (deciduous and coniferous trees) demand far more care and experience. They cannot be grown indoors. First hoarfrost takes their leaves away and the plants get ready for the winter rest. They don’t grow for the following few months. We start with pruning, cutting of tops and wiring branches in desired shape. We have to transplant them in the fresh mixture of soil and clip the roots. 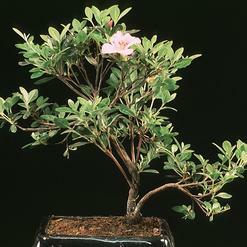 We recommend indoor bonsai for all beginners. 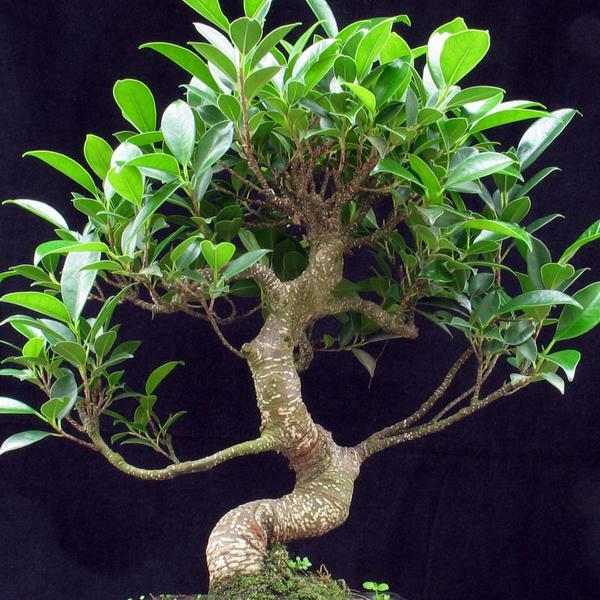 Indoor bonsai (Ficus, Sageretia,...) are clipped in the spring only once a year. Every such intervention exhausts the plant, therefore we have to give it some time to fully recover before another intervention. There are two aims in clipping the crown. Besides shaping the plant it provides the light to reach inside the crown. We clip branches that had grown lush, those that grow in wrong direction or are simply not needed to the plant. We cut branches close to the trunk or even slightly into it. Larger hurts have to be treated with graft pitch to prevent infection. We should preserve the strongest branches in the lower part and weaker branches in the upper part as to stimulate balanced shape. However, it is impossible to clip the plant so intensely as to keep its form unchanged through the course of time. We have to make sure that we leave the last bud on the branch pointed down when clipping the branch. Symmetry is not desired in bonsai, therefore we use wire to change course of certain branches. The height of indoor bonsai should be less than a meter as a rule. Most of the tree leaves are much too big for the shape of bonsai. To prevent the leaves from overgrowing we have to clip the leaves during the period of most exuberant growth. 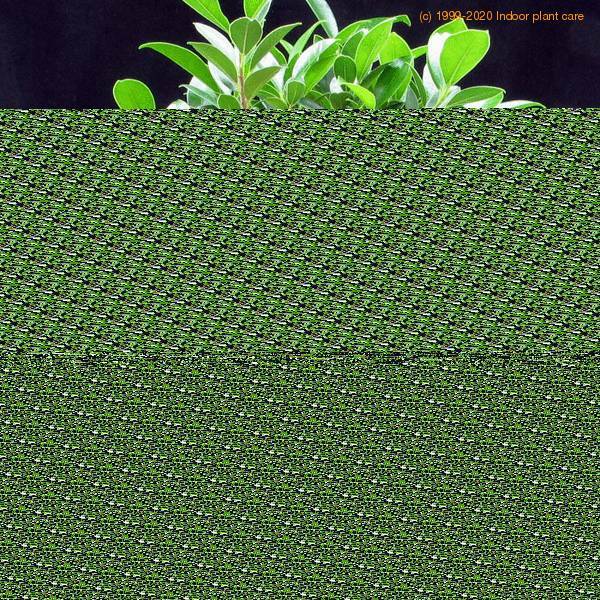 In this manner we stimulate the growth of new leaves that do not grow as large. 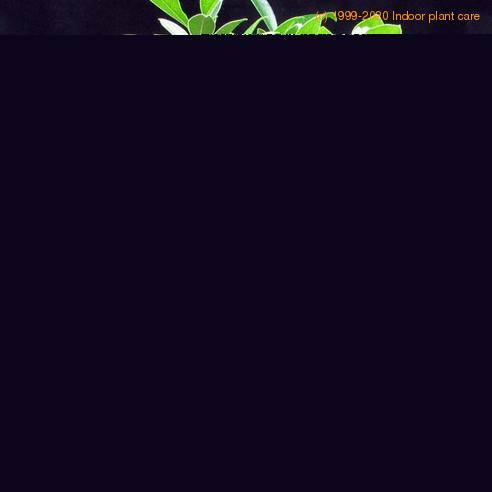 We have to leave the stalks on the plant and we should never clip all the leaves at the same time. We would like to warn against clipping all the leaves every year as the plant needs time to recover. In order to condense the crown we only clip the tops of branches and leave the rest intact. We apply this method when we want to keep the branch alive but hinder its growth. We clip the biggest and strongest sprouts. The buds are clipped as to stimulate the growth of others or because they grow on undesired place. Balance between above ground and under ground part of the plant is of high importance. The roots need to be clipped to keep the balance. We clip the idle or too strong roots and thus stimulate growth of tiny roots that pump the nutrients from the soil. Stronger roots only support the plant. Wiring gives the final shape to bonsai. 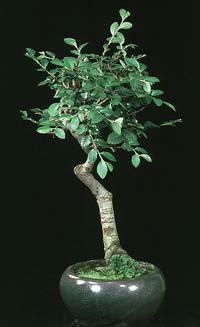 We use it to direct growth of branches and for twisting and thickening of trunk. 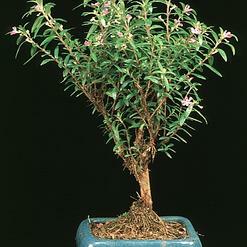 Different bonsai demand different time for their branches to keep the desired shape. The sorts with soft and elastic branches demand a few years. The wire can cut into the bark what leaves ugly scars but can be easily preventing by using the right wire. We recommend aluminous or copper wires of appropriate thickness and without plastic isolation. When removing the wire we have to cut it in slices as it hardens in several months and could break the branches if pulled away. We should never wire the plant immediately after transplanting it.